Start reading The Wee Free Men: (Discworld Novel 30) (Discworld series) on your Kindle in under a minute. 5.0 out of 5 starsTo fight monsters you just need courage, wit, and a frying pan. Tiffany is an amazing strong example for little girls. 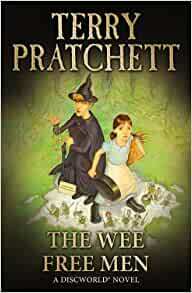 The Terry Pratchett's "Wee Free Men" is the 30th Discworld Novel and the first book in the Tiffany Aching Series. In this paperback edition, the illustrations are by Laura Ellen Anderson, while the 2003 version is by Paul Kidby. After watching "Terry Pratchett: Back in Black" (2017) film about the author, I decided I wanted to read his work. I had never read this particular kind of literature and shame on me! 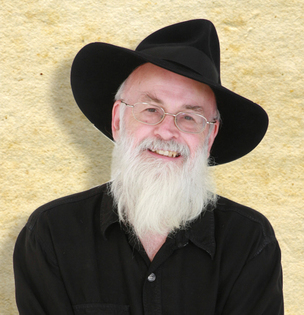 Terry Pratchett vocabulary is amazing, he plays with words, makes them musical. Reading out loud this book was so easy and fun. Sometimes I had to stop 'cause I kept laughing. The dialect of the Nac Mac Feegle is hilarious and you'll find yourself mimicking their way of cursing and threatening. "Crivens! I kicked meself in ma ain heid!". "We've got a cheap lawyer an' we're not afraid to use him!" If you have children, read this story with them. Play with them, and fight the Queen with them. I was searching a book with a strong girl with no frills that could be an example for our lil'woman and I'm so happy I discovered Tiffany Aching. Tiffany has wit, resilience, humor, and likes books. She loves her grandma and that's an important bond that will help her during the entire book. The Wee Free Men is followed by a second book "A hat full of Sky"(2004), a third "Wintersmith" (2006), a fourth "I Shall Wear Midnight" (2010) and a 5th and final book "The Shepherd's Crown". Plenty to read and enjoy. On a side note: The Jim Henson Company (the muppets, sesame streets, furchester hotel) has confirmed that there's a film in development. Be prepared! 5.0 out of 5 starsNew fan. I'm a new Terry Pratchett fan. There is 5 books in total for this Discworld series. There are so many many books which is comforting because I like his books. Family members are big fans of his and I am late catching on but glad discovered him for myself. My sister says this series was good to begin with. I am 36, the reading age for these are 9-11. Nearly finished first book, (don't always have good concentration) easy to read and I imagine it all and despite my concentration being poor sometimes I just want to keep reading. That says alot in my book. 5.0 out of 5 starsBest. Book. Ever. Bought this for a book trade. This is my hands down favourite book on the whole planet. Nothing else even comes close. I have read my old hardback copy at least 20 times and it never gets old. This is the book that got me into reading and it will always be a timeless classic to me. 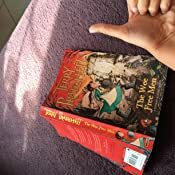 Pratchett is a genius - if you want your kids to read just try it. It taught me innumerable life lessons as well! Who knew? It's a fantastic book. I'd recommend it to anyone. 5.0 out of 5 starsMore down to earth than usual Pratchett, still Pratchett. The second best of the Tiffany Aching series, mainly thanks to the wee free people (let's not forget the Kelda). It's not as grounded in Disc World social (or even geographical) dynamics as many of the Disc World series is & I think the 'for young adults' label is a bit of a cop-out. It didn't come across as being for specifically any age group; many 'seriously' adult readers despise fantasy anyway (don't know why - if it's all fiction anyway, why not let fly with witches & a war-like clan whose individuals are 6 inches high?). I find the Aching series a bit preachy, almost as if Pratchett was trading magic for philosophy. It still manages to come up with a plot (not as well paced as early Disc) and a reasonable array of characters. As always Terry Pratchett does not fail to entertain. This book can be read by all ages. The wee free men swashbuckle their way through any situation with much aplomb and many smiles looking after Tiffany in their own style. Tiffany , a witch in training , holds her own and wins the day. Much recommended. Definitely pictsies, not pixies. Faerie folk but not what you'd expect. Drinking, fighting, stealing, brawling, and kicked out of Faerie land for being drunk and disorderly, and now the Discworld's best chance for survival, alongside a young, untrained witch whose other specialty is cheese, and advised by a toad. Laugh-out-loud funny, gripping and turns your preconceptions on their heads. Even if you've never read Discworld or Terry Pratchett before, this is a great book to read. The first in a sub-series, you need no previous knowledge of the world in which it's based to fully comprehend and enjoy it, nor do you need to read further unless you want to as the story has it's own conclusion, but should you want to read more, Tiffany, Rob and Big Yan won't disappoint you. 5.0 out of 5 starsAnother new old book. It seems that every time i re-read one of pTerry's books it always seems likenthe first time. Oh I remember the plot, but there is alwys something new, a little nuance or a hidden reference that leaps off the page at you.